1) Only markers that are in the viewable area are placed on the map. This won't help much if you are zoomed out all the way on the map, but will significantly boost the performance of the map if you are zoomed in on an area so that fewer markers are displayed. 2) The main description infowindow pop-up for each location is now generated on the fly without sending another request back to the CommunityWalk servers. This means that the window displays instantaneously. We will also be working to make the other infowindow pop-ups (photos, directions, comments, etc) work like this as well. Like most performance enhancements these required that I change a lot of the existing code, so the chance for bugs is significant. Please report bugs if you find them. I fix bugs as soon as I find them, so if you find a bug it probably means that I do not know about it and would be very grateful for the help! CommunityWalk is now up and running on its new servers. This should speed up the site a bit. We are going to be spending some time over the next few days trying to get any other performance issues taken care of as well. We will be switching CommunityWalk over to its new servers today at 2 PM PST, so the site will be down for a little while after 2 PM. When it comes back up it will be faster, though, so we think the downtime will be very worthwhile! I was browsing through CommunityWalk this morning and stumbled across a map with some amazing photography that I simply feel required to share it. You really must take a look at it and surf through the various photos that the map creator has put up. Frustrated by the slowness on CommunityWalk? We are too. Recently there has been a considerable increase in the traffic coming to the site. So it looks like CommunityWalk has finally grown enough to justify having some dedicated servers to handle it's needs. We are in the process of moving the system over so that we will have more resources to draw from to better handle the increased traffic we've seen recently. In the meantime please accept my apologies for any inconvenience the slowness has caused anyone. As I was surfing around the site today I noticed a few maps that I thought I would point out because they each made good use of the special window function. This lets you include media that is stored elsewhere on the Internet directly in your map. This one only has three locations on it, but they've made great use of the window special function to include audio files that can be played directly on the map. It's very cool. This map has a few locations that use the window function to display Google Video pages on the map. You need to click the "video" link and then enlarge the viewer (click the "Enlarge" link after clicking the "video" link) to see the whole video. You can find a brief tutorial on using the window function on the CommunityWalk Tutorials Page. The tutorial for the window function is at the bottom of the page. I plan on making the support for other types of media better as well. At the very least I want to add in support for embedded media like flash so that people can include videos from websites like YouTube in your map as well. 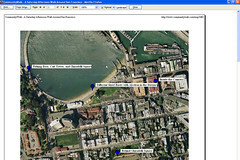 This would make it so that you could display the Google Video more clearly on the Waikiki map. I've just finished the first round of printing enhancements for the site. Now all browsers should print maps with icons on them, although the icons will not be numbered on IE. I've also added in another enhancement that makes the printing a lot better. If you click the "Show Titles" button on the left hand side of the map then you will see all the titles of all the locations on the map display simultaneously. If you print the map with the titles displayed then the titles will print properly, providing a means of labelling the different markers on the map. If you don't want to print with the titles just click "Hide Titles" and print away. There will be more enhancements to the printable view in the near future. I will be posting about them on this blog as they come up. Unfortunately the printing enhancements had to be put on the back burner a bit so that we could finish this release. Printing will be at the very top of the list going forward, though. 1) Explore page that lets you zoom into the map, select a category, or enter a search term to find different public maps on CommunityWalk. If you want you can even enter a search for a specific area of the map! 2) Click to zoom and right click to zoom out! This is now available on all maps and makes the experience much more dynamic. On the Explore page zooming in on the map will filter the result list, showing only maps in that area. One interesting note about the zoom. It will zoom in quickly when it is zoomed out and then slow down as it gets closer to ground level. 3) Exposed pictures. We brought the pictures out of hiding, adding the first one to the main description infowindow for each location as well as displaying the pictures on the explore page. 4) Hidden categories. If a category is not being used it won't be displayed in view mode so that the legend acurately reflects what is on the map. 5) Editing and deleting comments. Now, if you are logged in you can edit or delete a comment you've made for 10 minutes. 6) Performance Enhancements. We've put in place a few technical enhancements (GZip and caching) that should speed up CommunityWalk just a bit. We will be cleaning up the release for the next few days so if you find any bugs or have any feedback please let me know. It is very helpful when people report bugs or let us know about something that could be done better! We are in the process of releasing the latest enhancements to CommunityWalk. There might be a little downtime as we try and figure out some problems that are occurring with the deployment. Also, unfortunately, we lost about 20 minutes worth of data from when we began the process to when the problem occurred. I apologize tremendously to anyone who was inconvenienced by this. It will not happen again. We've got the system stabilized. Unfortunately the data loss is a reality. It looks like if you were working on the system between 4:10 PM and 4:35 PM PST then your work was compromised during the release. Anything done before 4:10 PM or after 4:35 PM PST should be fine. Again I apologize tremendously for any inconvenience this caused anyone. We're dotting the i's and crossing the t's on the Explore Page release. It's really fun to play around with it, exploring all of the different communities out there! We're also pushing out some signficant enhancements and bug fixes for the map page that I think will have a great impact. There are a few enhancements in there that have been requested for some time. Unfortunately I wasn't able to make as much progress on the printing as I would have liked. It is an interesting challenge that is taking a little longer than I had anticipated. It will remain the highest priority on the list until I can come up with a great solution for it. Recently, we moved to a new area (as did a lot of people) trying to escape the ridiculous housing market. I created a community using your tool and everyone has been on plotting locations, helping all the new people find restaurants, entertainment etc. With the new Explore Page and the increasing number of extraordinary maps people are creating, CommunityWalk is going to become an incredibly valuable resource for people moving to new areas. It looks like it has already begun!